You are here: Home » GENRE » Computers » Apple releases its ‘Kindle-killer’ iPad mini! Apple releases its ‘Kindle-killer’ iPad mini! Apple have gone live with their new iPad mini, with a design that is 23 percent thinner and 53 percent lighter than the third generation iPad. The new iPad mini features a 7.9-inch Multi-Touch display, FaceTime HD and iSight cameras, and 10 hours of battery life. Apple also announced the fourth generation iPad featuring a 9.7-inch Retina display, new Apple-designed A6X chip, and FaceTime HD camera. 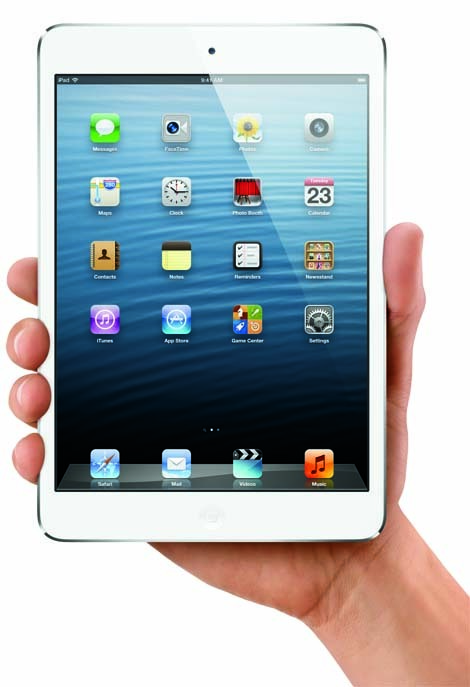 iPad mini comes with an aluminum and glass design that is 7.2 mm thin and weighs in at 0.68 pounds. It features a front-facing FaceTime HD camera and a 5 megapixel iSight camera on the back for recording still pictures and recording 1080p HD video. The iSight camera includes video image stabilization and both cameras feature backside illumination to help users capture pictures in low light. iPad mini also allows sharing of photos with friends using iCloud’s Shared Photo Streams. It’s certainly mini, it’s certainly an iPad! iPad mini features dual-band 802.11n Wi-Fi support for speeds up to 150 Mbps. iPad mini is available in Wi-Fi + Cellular models which are world-ready with support for wireless standards, including LTE and DC-HSDPA. Its Personal Hotspot feature means you can share a cellular data connection via Wi-Fi, Bluetooth or USB with up to five other devices such as MacBook Pro, iPod touch or another iPad. The new fourth generation iPad features their 9.7-inch Retina display and includes a new Apple-designed A6X chip that Apple claim delivers up to twice the CPU performance and up to twice the graphics performance of the A5X chip. Many have touted the much anticipated iPad mini as an attempt to take on Amazon’s range of tablets and ebook readers… well, in everything but price! iPad mini with Wi-Fi models will be available in black & slate or white & silver on Friday, November 2, for a suggested retail price of $329 for the 16GB model, $429 for the 32GB model and $529 for the 64GB model. The fourth generation iPad with Wi-Fi models will also be available on Friday, November 2, in black or white for a suggested retail price of $499 for the 16GB model, $599 for the 32GB model and $699 for the 64GB model. Apple shocks world with Swift open-source move.